The Zeray Gazette: How Long Could Luke Survive in a Tauntaun? How Long Could Luke Survive in a Tauntaun? Luke Skywalker survived the arctic conditions of the planet Hoth in The Empire Strikes Back only because Han Solo killed his tauntaun (a native beast of burden) and shoved Luke inside the animal's warm carcass. 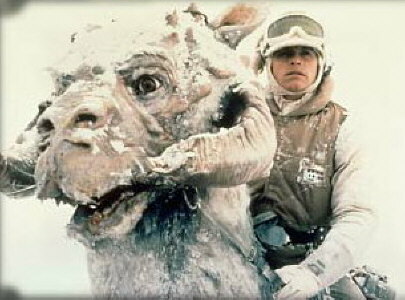 This led the blog Wolf Gnards to ask, as a practical question, how long could Luke really survive in a tauntaun's body? In a normal environment, a carcass gets cold in 8 to 36 hours losing an average rate of 1.6 degrees Fahrenheit per hour. However, the ice world of Hoth is not an average environment. The Star Wars database lists that Hoth reaches nightly temperatures of -60 F. In a frigid, sub-zero environment, body heat can be lost almost 32 times faster. This means a Tauntaun's body heat could drop almost 51.2 F every hour. Considering that Han Solo's Tauntaun died of severe hypothermia even before it was cut open with Luke's light saber, one could assume it's core body temperature was already well below normal. The problem for Luke is if the Tauntaun's body temperature reaches freezing point those once toasty guts, blood, and assorted alien goo, will in fact become a frozen coffin. If the Tauntaun died of cardiac arrest due to hypothermia with an average body temperature of 75 F (23 C), and if Tauntaun blood freezes at 28.4 F (-2 C), then Han has roughly 56 minutes to set up a shelter before Luke once again is in danger of losing his life in the barren wasteland of Hoth. It's an interesting hypothesis, but it should be followed with rigorous scientific testing. Any volunteers? An experienced and aged hunter once told me a tale from his teen age years. He shot a deer in sub-freezing temps, but it was only minutes before full dark. He might have been able to make it back to his truck, but he wouldn't be able to drag the carcass with him. And he wouldn't be able to find it again if he left it where it had fallen. If he didn't want the wolves to eat his deer, he would have to stay with it all night. It was sub-freezing temps, but he was worried about the residual body heat causing the meat to spoil. So he gutted the animal, and propped the body cavity open with sticks to make sure that it would cool down. Animal fur is an amazing insulator, and animals evolved to thrive in arctic conditions have even better insulation. What did the Inuit use to keep from freezing to death, anyway? Click back to the original link at Wolfgnards. They have some data to back up their calculations as to how fast a "carcass" cools down, but look at what they are using to prove their point and you see that they are talking about how fast a human body loses heat after death. Hey! I thought humans were basically fur free! Isn't that why we put on coats when going outside when the snow falls? Isn't that why the Inuit fashioned garments from seal skin, fur side out? I was always under the impression that it was because human bodies have a high thermal conductivity, and the insulation shifts it lower. Also, wasn't that Tauntaun in the movie considerably larger than a human? Isn't that why humans rode them in the first place? The rate of heat loss isn't just due to heat insulation, but also a function of surface-to-mass ratio. Generally speaking, larger animals have a lower StM ratio than smaller creatures, and usually have a problem keeping cool. My shih tzu is a lapdog, and his body is draped with the most amazingly long and luxurious coat of fur you would ever hope to see. But he still starts shivering before my short-haired pit bull feels the cold, because he has less tissue between his skin and his vital organs. A well insulated lapdog's core body temperature drops faster than a barely insulated dog that is five times his size, because he has less mass to store thermal energy. The assumptions made in the original post are way, way off. What Earthly animal would be closest to a Tauntaun's thermal conductivity and mass? What creature found close to home would have fur that had insulating properties close to that of an animal that was evolved to survive on ice planet Hoth? So wake me up when the geeks at Wolfgnards find the stones to go and conduct some tests on grizzlies they kill during an arctic snowstorm. The assumptions made in the original post are way, way off. What Earthly animal would be closest to a Tauntaun's thermal conductivity and mass? A bear might be a good comparison, or possibly a yak. Let's go hunting and find out. @Rummel: I must say I am duly impressed. Moreso, I must berate myself for having not seen your points sooner myself. I forgive myself in part because I did not visit the original link which provided you with the statistics based on humans. One thing I would like to add: lard. Blubber. Adipose. Natural heat insulation. @John: thanks again for an unexpected interesting topic!